No management software would be complete without the ability to purchase items and code the costing directly to the project. V Sign Software created a purchase order feature that has all of the properties that one would need to make the details flow with little effort. 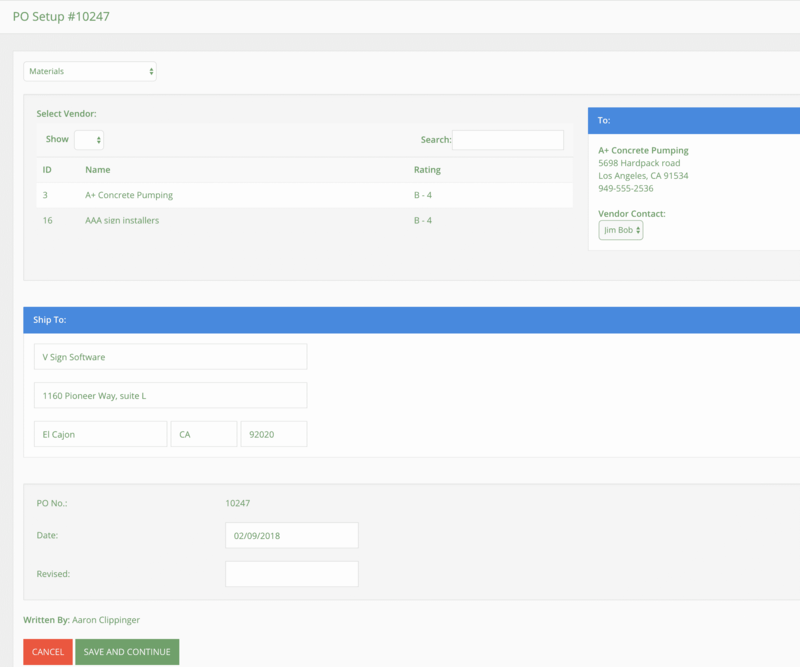 Now writing PO’s is a one click process using the built in drop down menus and auto population. Simply stated, everything we could think of to save you time and money, we included. The purchase order section is split into three groups; materials, outsource, and sub-contract. Each section has it’s own characteristics to help the user properly communicate everything they need to the vendor. Materials for example, will have their own inventory list in a column for one-click ease. There are areas to enter quantities and prices, as well as the date for when the product will be needed.